Diabetic ketoacidosis (DKA) is a life-threatening emergency caused by a relative or absolute deficiency of insulin. This deficiency in available insulin results in disorders in the metabolism of carbohydrate, fat, and protein. Main clinical features of DKA are hyperglycemia, acidosis, dehydration, and electrolyte losses such as hypokalemia, hyponatremia, hypocalcemia, hypomagnesemia, and hypophosphatemia. Hyperglycemic Hyperosmolar Nonketotic Syndrome (HHNS) is a condition characterized by the presence of hyperglycemia, hyperosmolarity, and dehydration. There is enough production of insulin to reduce ketosis but not to control hyperglycemia. Persistent hyperglycemia causes osmotic diuresis, which results in the fluid and electrolyte imbalances. The clients with HHNS may present with symptoms of hypotension, tachycardia, marked dehydration, and neurological manifestation such as seizures, hemiparesis, and alterations in the sensorium). 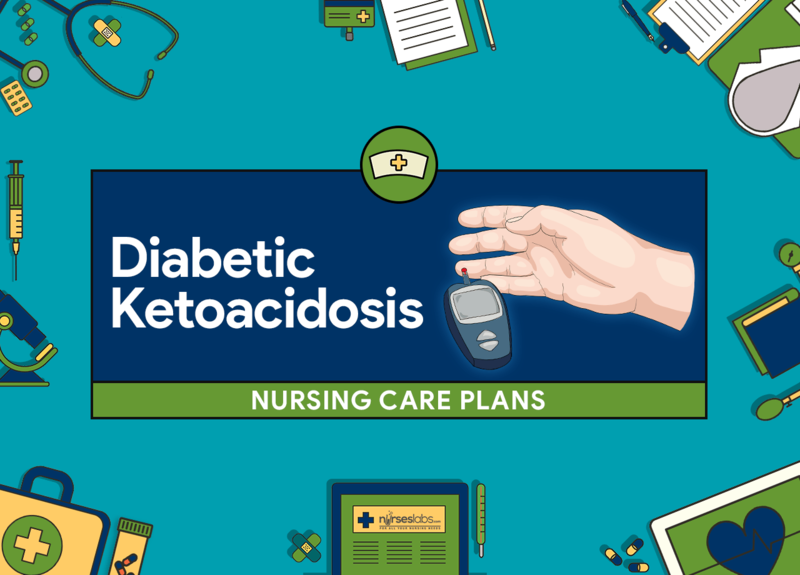 The nursing care plan for clients with Diabetic Ketoacidosis and Hyperglycemic Hyperosmolar Nonketotic Syndrome includes provision of information about disease process/prognosis, self-care, and treatment needs, monitoring and assistance of cardiovascular, pulmonary, renal, and central nervous system (CNS) function, avoiding dehydration, and correcting hyperglycemia and hyperglycemia complications. Hypermetabolic state: release of stress hormones (e.g., cortisol, growth hormone, and epinephrine). Increased urinary output, diluted urine. Recent weight loss; weakness, anorexia, fatigue. Reported inadequate food intake, lack of interest in food. Client will display normal energy level. Client will take appropriate amounts of calories/nutrients. Client will demonstrate stabilized weight or gain toward desired range with normal laboratory values. Determine client’s dietary program and usual pattern. Recognizes deficits and deviations from therapeutic needs. Monitor weight daily or as indicated. Assessing sufficiency of food intake, including absorption and utilization. Auscultation bowel sounds, note the presence of abdominal pain/abdominal bloating, nausea or vomiting. Maintain on NPO status, as indicated. Imbalances in the fluid and electrolytes and hyperglycemia reduces gastric motility resulting in delayed gastric emptying that will influence the selected intervention. Involve patients in planning family as indicated. Provide information on the family to understand the nutritional needs of the patient. Recognize signs of hypoglycemia. Hypoglycemia can occur because of a reduced carbohydrate metabolism while still given insulin, it can potentially be life threatening and should be recognized. Monitor laboratory studies (Serum glucose, pH, HCO3, acetone). With a controlled fluid replacement and insulin therapy, blood glucose will gradually decrease. With the optimal insulin dosages administration, glucose can then enter the cells and will act as energy. As a result, acetone levels decrease and acidosis is corrected. Perform fingerstick glucose testing. Monitoring of blood glucose such as using finger-stick blood samples has helped in diabetes management for effective glycemic control. Administer glucose solution, e.g., dextrose and half normal saline. Solutions containing glucose are added after insulin and fluids have brought the blood glucose to approximately 400 mg/dL. When the metabolism of carbohydrate reaches normal, caution must be taken to prevent hypoglycemia. Administer regular insulin by intermittent or continuous IV method. Intravenous (IV) infusion is the choice route of insulin delivery because the rapid onset and short duration of action associated with IV infusion allow for matching insulin requirements to rapidly changing blood glucose levels. Collaborate with a dietician for initiation of resumption of oral intake. Helps in calculating and adjusting diet to meet nutritional needs of the client; Dietician assists the client and the family on producing meal plans. Provide a diet consisting of 60% Carbohydrates, 20% fats, 20% proteins in designated number of meals. Complex carbohydrates (peas, beans, whole grains, and vegetables) decreases glucose and cholesterol levels. Food intake is scheduled according to specific insulin characteristics and individual client’s response. Administer medication as prescribed. Beneficial in treating symptoms related to affecting GI tract such as diabetic gastroparesis, to improve oral intake and nutrient absorption. Medications to control nausea and vomiting. Medications to stimulate the stomach muscles.